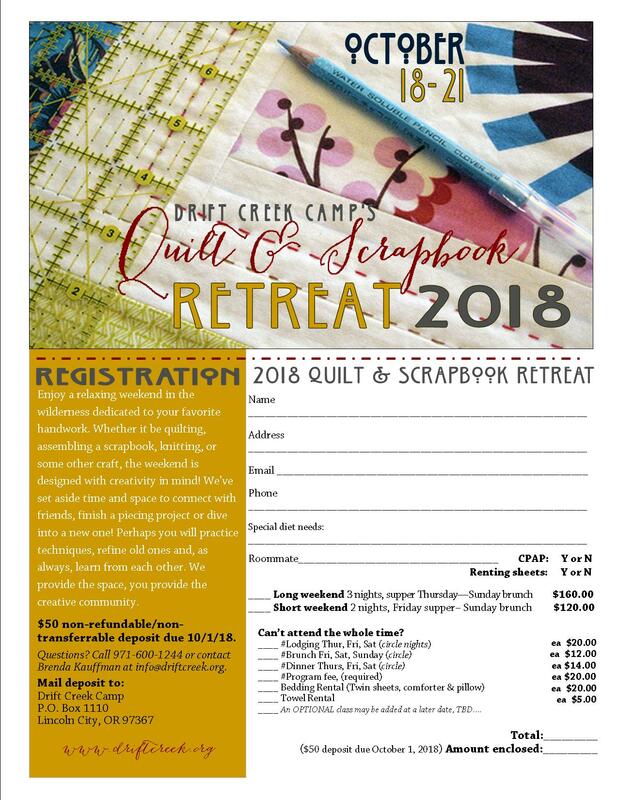 If you who have sewing projects, quilts, scrapbooks, or, if you are planning ahead, and want to work on Christmas cards, consider participating in Drift Creek’s Fall Quilt & Scrapbook Retreat, October 17-20, 2019. The retreat offers an opportunity to set aside time to get into a creative groove, without the distractions of life’s daily demands. DCC provides workspace, tasty meals, and coffee delights while you bring your supplies and creativity! Meanwhile, there will be friends, old and new, to connect with and learn from. Folks have the option of arriving Thursday or Friday, whichever day suits your schedule best. The retreat is not limited to people working on quilts or scrapbooks, the idea is to bring along whatever type of project you might have….whether it’s a comforter, embroidery, knitting, paper crafts, recording your family’s memories or even writing in your journal, all are welcome to enjoy this chance to dedicate time while camp takes care of the space. We will have room for sewing machines as well as comfy chairs in front of the fire…Or venture outside to enjoy a beautiful stroll through the forest. Each participant will have the opportunity to receive a door prize. We have a couple of local quilt shops that donate gifts. Everyone attending will have the opportunity to have their name be drawn for these “grand prizes’. In addition, for those who wish to participate, there will be a “round robin” gift exchange as well. Anyone wanting to participate can bring a new wrapped (or bagged) gift valued at approximately $10. The hope is that the weekend will give busy women an opportunity to slow down, enjoy the beauty of God’s creation, connect with others in a faith community, and maybe even cross a project off her list! We invite girls between the ages of 10 and 18 to attend for a discounted rate (essentially the cost of their meals.) So if you have a daughter, sister, niece, granddaughter, neighbor, etc. who would enjoy the opportunity, bring her along! It will be a great weekend to spend time with a special young lady in your life!